Copyright © 1999 Saul Coval Computers. Handle Test Jig to make quick connections of special communications transformers at mass production. 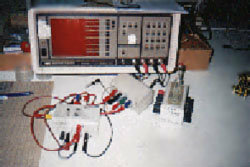 Plastic Box with Spring contacts (Gold-Iridium) connected to external Jacks through low inductance wiring.